This article describes working with collection views in a Xamarin.Mac app. It covers creating and maintaining collection views in Xcode and Interface Builder and working with them programmatically. When working with C# and .NET in a Xamarin.Mac app, the developer has access to the same AppKit Collection View controls that a developer working in Objective-C and Xcode does. Because Xamarin.Mac integrates directly with Xcode, the developer uses Xcode's Interface Builder to create and maintain Collection Views. A NSCollectionView displays a grid of subviews organized using a NSCollectionViewLayout. Each subview in the grid is represented by a NSCollectionViewItem which manages the loading of the view’s content from a .xib file. 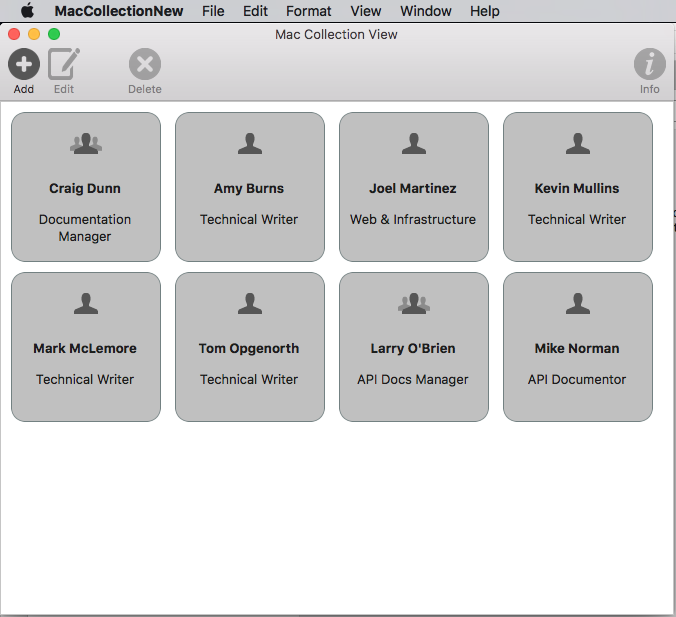 This article covers the basics of working with Collection Views in a Xamarin.Mac app. It is highly suggested that you work through the Hello, Mac article first, specifically the Introduction to Xcode and Interface Builder and Outlets and Actions sections, as it covers key concepts and techniques that are used throughout this article. The main goal of a Collection View (NSCollectionView) is to visually arrange a group of objects in an organized fashion using a Collection View Layout (NSCollectionViewLayout), with each individual object (NSCollectionViewItem) getting its own View in the larger collection. Collection Views work via Data Binding and Key-Value Coding techniques and as such, you should read the Data Binding and Key-Value Coding documentation before continuing with this article. 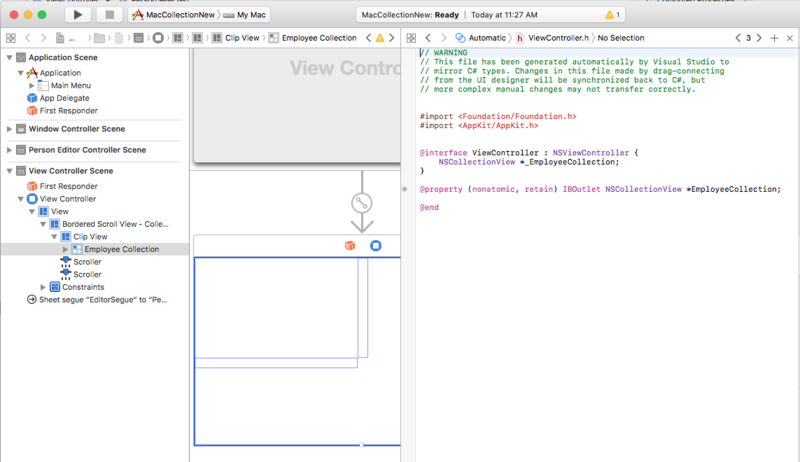 The Collection View has no standard, built-in Collection View Item (like an Outline or Table View does), so the developer is responsible for designing and implementing a Prototype View using other AppKit controls such as Image Fields, Text Fields, Labels, etc. This Prototype View will be used to display and work with each item being managed by the Collection View and is stored in a .xib file. Because the developer is responsible for the look and feel of a Collection View Item, the Collection View has no built-in support for highlighting a selected item in the grid. Implementing this feature will be covered in this article. Before Data Binding a Collection View in Interface Builder, a Key-Value Coding (KVC)/Key-Value Observing (KVO) compliant class must be defined in the Xamarin.Mac app to act as the Data Model for the binding. The Data Model provides all of the data that will be displayed in the collection and receives any modifications to the data that the user makes in the UI while running the application. The PersonModel Data Model will be used throughout the rest of this article. Data Binding with a Collection View is very much like binding with a Table View, as NSCollectionViewDataSource is used to provide data for the collection. Since the collection view doesn't have a preset display format, more work is required to provide user interaction feedback and to track user selection. Since the Collection View does not include a default cell prototype, the developer will need to add one or more .xib files to the Xamarin.Mac app to define the layout and content of the individual cells. This will add an EmployeeItem.cs, EmployeeItemController.cs and EmployeeItemController.xib file to the project's solution. 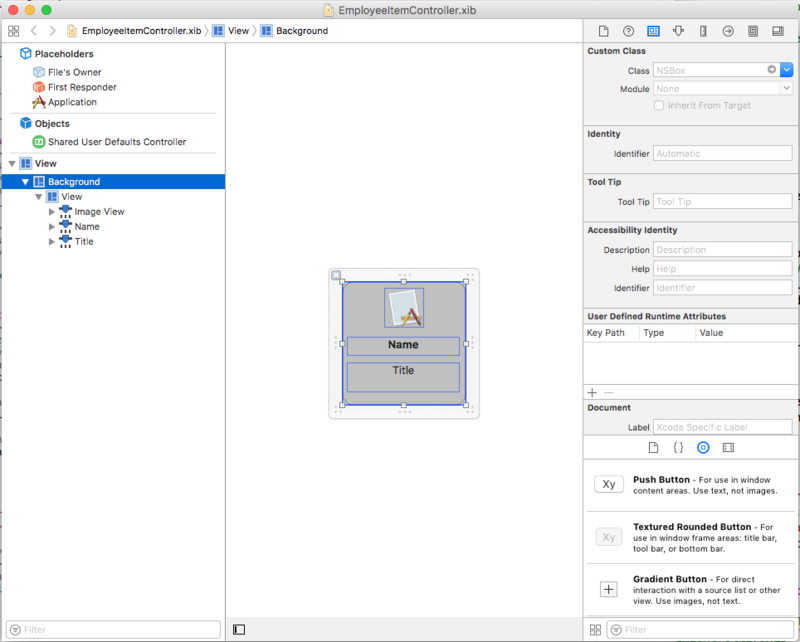 Double-click the EmployeeItemController.xib file to open it for editing in Xcode's Interface Builder. Return to the Standard Editor and select the Image View. Save the changes to the .xib file and return to Visual Studio to sync the changes. /// be displayed in the collection view as defined in the associated .XIB file. /// The person that will be displayed. /// Gets or sets the color of the background for the item. /// Gets or sets a value indicating whether this <see cref="T:MacCollectionNew.EmployeeItemController"/> is selected. Looking at this code in detail, the class inherits from NSCollectionViewItem so it can act as a prototype for a Collection View cell. The Person property exposes the class that was used to data bind to the Image View and Labels in Xcode. This is an instance of the PersonModel created above. A Collection View Data Source (NSCollectionViewDataSource) provides all of the data for a Collection View and creates and populates a Collection View Cell (using the .xib prototype) as required for each item in the collection. /// Collection view data source provides the data for the collection view. /// Gets or sets the parent collection view. /// Gets or sets the data that will be displayed in the collection. /// Initializes a new instance of the <see cref="T:MacCollectionNew.CollectionViewDataSource"/> class. /// Gets the number of sections. /// Gets the number of items in the given section. /// Gets the item for the give section and item index. Looking at this code in detail, the class inherits from NSCollectionViewDataSource and exposes a List of PersonModel instances through its Data property. Since this collection only has one section, the code overrides the GetNumberOfSections method and always returns 1. Additionally, the GetNumberofItems method is overridden at it returns the number of items in the Data property list. The MakeItem method of the Collection View is called to create or return a reusable instance of the EmployeeItemController and its Person property is set to item being displayed in the requested cell. The Identifier (EmployeeCell) used in the MakeItem call must match the name of the View Controller that was registered with the Collection View. This step will be covered in detail below. To handle the selection and deselection of items in the collection, a NSCollectionViewDelegate will be required. Since this example will be using the built in NSCollectionViewFlowLayout layout type, a NSCollectionViewDelegateFlowLayout specific version of this delegate will be required. /// collection view for the Flow-Based layout type. /// Gets or sets the parent view controller. /// Initializes a new instance of the <see cref="T:MacCollectionNew.CollectionViewDelegate"/> class. /// Handles one or more items being selected. /// Handles one or more items being deselected. The ItemsSelected and ItemsDeselected methods are overridden and used to set or clear the PersonSelected property of the View Controller that is handling the Collection View when the user selects or deselects an item. This will be shown in detail below. With all of the required supporting pieces in place, the main storyboard can be edited and a Collection View added to it. Double-click the Main.Storyboard file in the Solution Explorer to open it for editing in Xcode's Interface Builder. Save the changes and return to Visual Studio to sync. All of the supporting pieces have now been put into place with a class to act as the data model (PersonModel), a NSCollectionViewDataSource has been added to supply data, a NSCollectionViewDelegateFlowLayout was created to handle item selection and a NSCollectionView was added to the Main Storyboard and exposed as an Outlet (EmployeeCollection). The final step is to edit the View Controller that contains the Collection View and bring all of the pieces together to populate the collection and handle item selection. /// The View controller controls the main view that houses the Collection View. /// Gets or sets the person currently selected in the collection view. /// Initializes a new instance of the <see cref="T:MacCollectionNew.ViewController"/> class. /// be configured before displaying to the user. /// Configures the collection view. /// Populates the Datasource with data and attaches it to the collection view. /// Occurs when selection changed. /// Raises the selection changed event. Taking a look at this code in detail, a Datasource property is defined to hold an instance of the CollectionViewDataSource that will provide the data for the Collection View. A PersonSelected property is defined to hold the PersonModel representing the currently selected item in the Collection View. This property also raises the SelectionChanged event when the selection changes. Additionally, the type of the View Controller must match the name of the .xib file that defines the prototype exactly. In the case of this example, EmployeeItemController and EmployeeItemController.xib. The actual layout of the items in the Collection View is controlled by a Collection View Layout class and can be changed dynamically at runtime by assigning a new instance to the CollectionViewLayout property. Changing this property updates the Collection View appearance without animating the change. 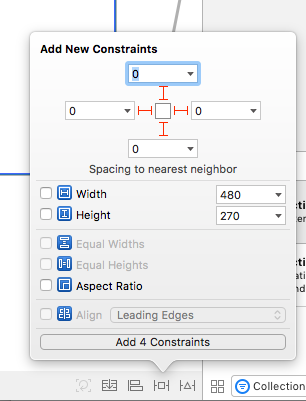 Apple ships two built-in layout types with the Collection View that will handle most typical uses: NSCollectionViewFlowLayout and NSCollectionViewGridLayout. If the developer required a custom format, such as laying the items out in a circle, they can create a custom instance of NSCollectionViewLayout and override the required methods to achieve the desired effect. The ItemSize property defines the size of each individual cell in the collection. The SectionInset property defines the insets from the edge of the collection that cells will be laid out in. MinimumInteritemSpacing defines the minimum spacing between items and MinimumLineSpacing defines the minimum spacing between lines in the collection. 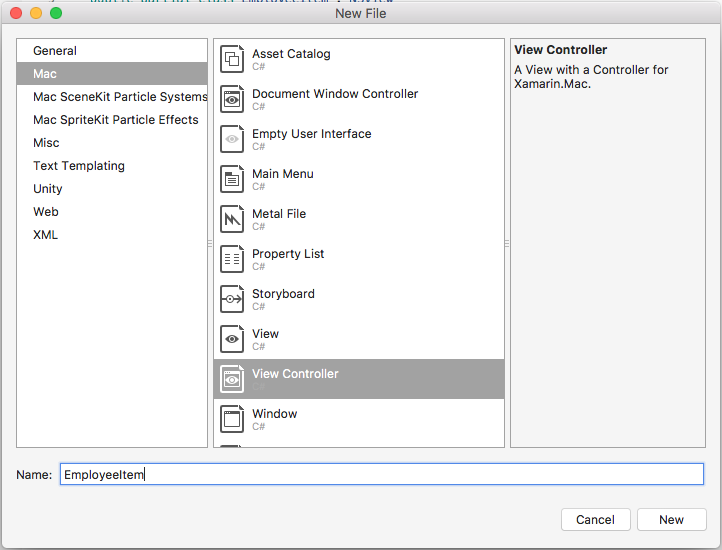 This article has taken a detailed look at working with Collection Views in a Xamarin.Mac application. First, it looked at exposing a C# class to Objective-C by using Key-Value Coding (KVC) and Key-Value Observing (KVO). Next, it showed how to use a KVO compliant class and Data Bind it to Collection Views in Xcode's Interface Builder. Finally, it showed how to interact with Collection Views in C# code.